In the past, anyone could describe a typical Condé Nast Traveler cover. The magazine pretty much always went with a large photograph of some exotic location that you’ll never visit, along with a model enjoying the scenery. That’s why FishbowlNY loves the March issue of Traveler so much — it’s different. 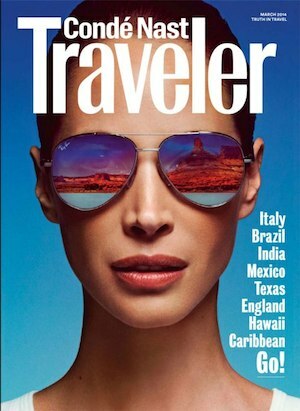 The latest Traveler features a bold, up close shot of Christy Turlington Burns donning sunglasses. The exotic location we’ve all come to expect from the front of Traveler has been reduced to a mere reflection in Turlington Burns’ shades. We haven’t seen the inside of Traveler yet, but we definitely think they nailed the cover.